Confession: It makes me uncomfortable looking at photos of CNBlue at airports, on their way to wherever, eating at restaurants etc. But it makes me cringe when the photos are taken at such close range. It’s not just CNBlue but celebrities in general, and Korean stars in particular. Sure, as public figures, it’s part of the territory for their photos to be snapped whenever they step out in public. That’s why we call celebrities as “public properties”. But surely, there is a limit as to how much we could “own” them? And surely, that limit can be measured in real terms? That even as celebrities, they are also entitled to their “personal space”? Sure, we see them being calm, even smiling, in these paparazzi-like photos. But what can they do? If they scowl even if a camera is practically on their faces, they’d get fan hate and be criticized. This paparazzi treatment wherever they go is just the tip of the iceberg. Lately, there have been stories of fans stalking their idols up to their homes. These are not exactly new stories because we’ve previously heard how these crazy fans (called sasaeng in Korean) even went as far as trespassing the homes of their idols and taking photos of them while they sleep. In the US, they would have been charged for trespassing and violating someone’s privacy. And it’s easy for us to condemn such bad fan behavior. I’m not saying they are not bad, they’re beyond bad. But every time we retweet or repost photos taken by fans of their idols in public spaces, and at such close range and during unofficial events, isn’t it a way of condoning, and therefore, encouraging such behavior? If we let fans step into stars’ personal space, what will stop them from stalking? Unless of course we don’t have a concept of what personal space is so we think it’s all right to chase after them to snap photos of their faces at such close range? 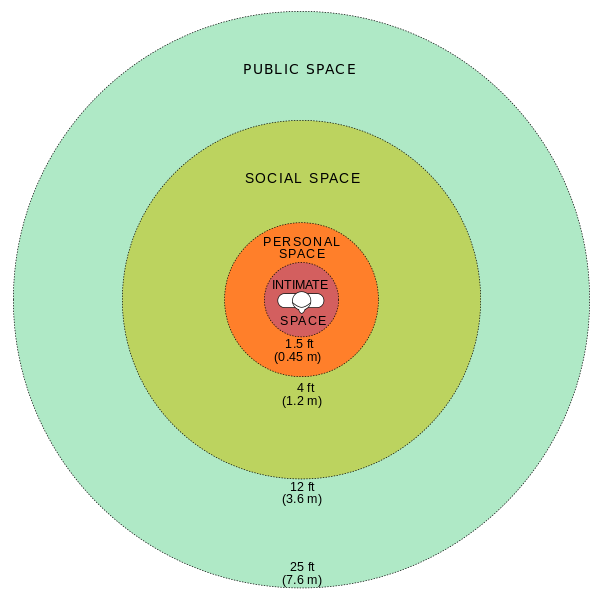 Personal space is that area from 1.5-3.9 ft. That’s almost half a meter to 1.18 meters or about three steps away from the person. 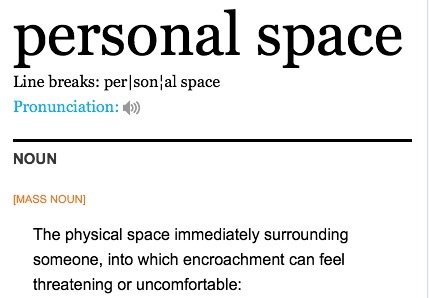 Beyond that, you’re already invading their personal space. Perhaps there is very little or no understanding at all that even though they are “public properties”, they are also human beings and not animals in the zoo. Even animals in the zoo are separated from humans by cages. Do we want to see them in cages just so they could maintain a certain semblance of privacy? I do understand the need to know more about oppa. And that’s where the journey from being a fan to a stan starts. You want to know beyond what they choose to share in their interviews even to the point of knowing what they ate for breakfast, what color of boxers they prefer, who they’re dating and where they live. Do these fans even know that stalking is a criminal offense? There’s a huge difference between spazzing and stalking. And seriously, entertainment agencies need to rectify this culture before people get hurt. Protect your talents, they’re your milking cows for crying out loud! And for fans – if we want to enjoy our idols’ music, we listen to their songs or watch their concerts. If we want to ogle their faces, there are the dramas, music videos and photos. If we want to shake their hands, that’s what fan meetings are for. And if we want to marry them, write a fan fiction. But if you become too obsessive, there’s a need to see a shrink. I have listened to Japanese music for twenty years, and being in anime fandom for so long, and I started watching J-dorama, and got in so deep in loving everything about Japan. Then, got introduced to Korean entertainment industry since Winter Sonata and Endless Love (Autumn’s Tale), realized that some of Japanese music that I love are actually sang by Korean singers, such as BoA and Younha, but that still did not make me put some interest in Korean entertainment (well, except for Goong and Kim Jeong Hoon). But everything changed since I watched CNBLUE’s Blue Storm DVD concert. I fall for them. I tried watching them live. I just can’t stop, maybe until I watch their concert in Japan. But this thing with watching them live really exposed me to some awful facts. Korean fandoms are just terrifying. Once upon a time, I thought Sakurai Sho was really rude for crashing fan’s phone for taking pictures and following him. Now, I really hope Lee Jong Hyun (why not Yonghwa? Well, he is too stoical and kind, thus he is highly unlikely to harm fans physically) would just lost his patience and throw tantrums to the flock of fangirls who keep following them everywhere, matching their flight schedules, sitting on airports with those gigantic tele lens, even checked in to same hotels! I saw it myself in Singapore when I finished watching their concert and head to the airport to stay there because my flight was early in the morning. I saw how the fans were running here and there looking for the boys. I know how much fans want to get close to them, but it will be wise to respect their privacy. Another thing that I am disappointed with international concerts (outside Korea and Japan) is that the audience are busy taking pictures and recording with their phones. The band held their concerts with the purpose of the fans to enjoy, sing, jump, chant along with them. My recent CNBLUE concert in Malaysia was a bit disappointing where only less than half of the audiences really showed interest in their live performance. Very few of the audiences in seating section stood up even when Jungshin shouted “Wake up, wake up!” This is too sad. I totally agree with everything you said. it’s just so frustrating that there are fans who seem to lose sight of the privilege of being able to experience a concert in person because they are too busy trying to “capture” the moment. for what? for bragging rights later? and don’t get me started on the stalking. yes, I do wish LJH can do a Sakurai Sho… maybe not with an umbrella but with his guitar. that would be a sight. I do think that JYH is slowly starting to learn that too much fan service ain’t good. some fans just abuse his goodwill and never realize that they are overstepping the boundaries and violating his and the rest’s privacy. and THIS: “Korean fandoms are just so terrifying”. tell me about it. thank you for the comment, I enjoyed reading it!